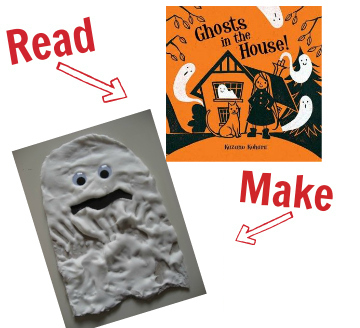 Our first Read & Make post was so crazy popular that I knew I needed to keep this theme going. I see all of you pinning fall ideas on Pinterest and searching for them here on the blog. 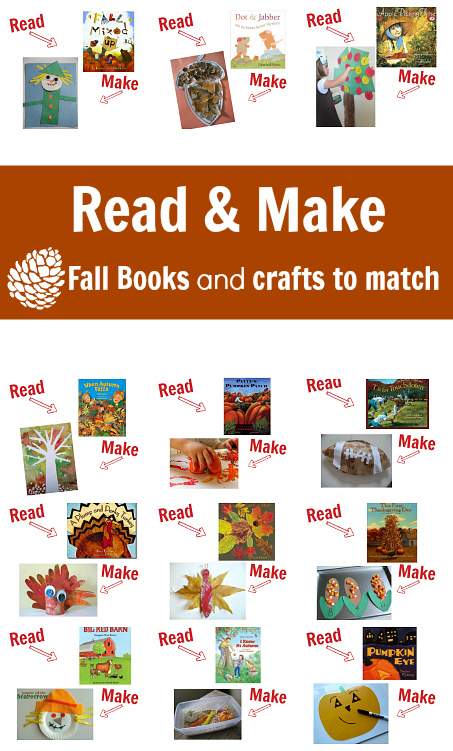 I thought I would help you out by sharing this easy cheat sheet of 23 fall books with crafts to match. 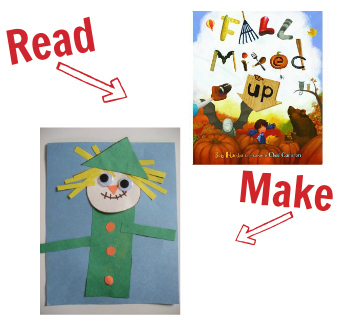 Fall Mixed Up by Bob Raczka and Shape Scarecrow Craft . 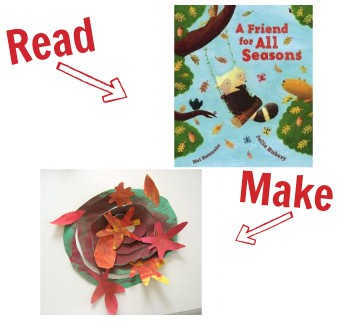 A Friend for All Seasons by Julia Hubery and Falling Leaves Craft. 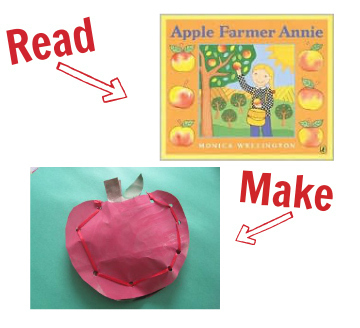 Apple Farmer Annie by Monica Wellington and Lacing Apple. Ghosts in the House! by Kazuno Kohara and Puffy Paint Ghost. 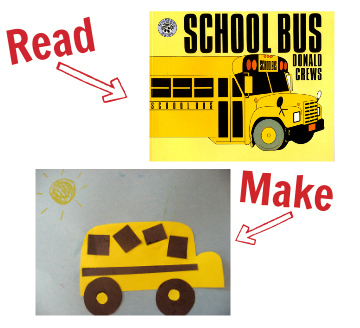 School Bus by Donald Crews and Cut & Paste School Bus Craft. 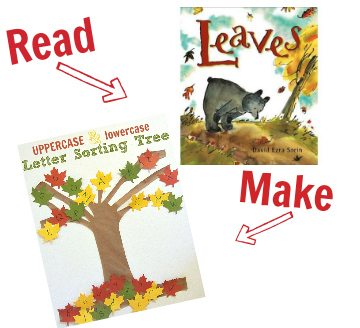 Leaves by David Ezra Stein and Uppercase Lowercase Letter Sorting Tree. 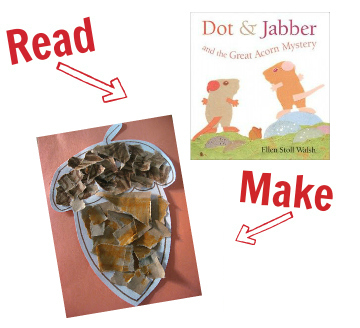 Dot & Jabber and the Great Acorn Mystery by Ellen Stoll Walsh and Torn Paper Acorn. When Autumn Falls by Kelli Nidey and Tape Resist Fall Tree. 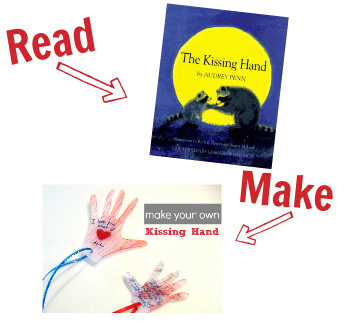 The Kissing Hand by Audry Penn and Kissing Hand Necklaces. 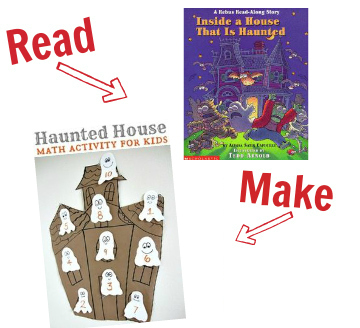 Inside a House That Is Haunted by Alyssa Satin Capucilli and Haunted House Math Activity. 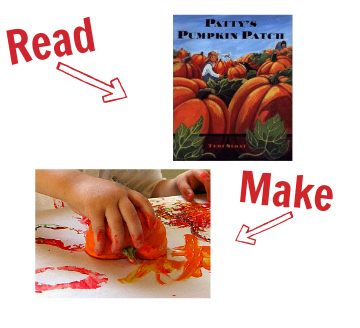 Patty”™s Pumpkin Patch by Teri Sloat and Pumpkin Printing. 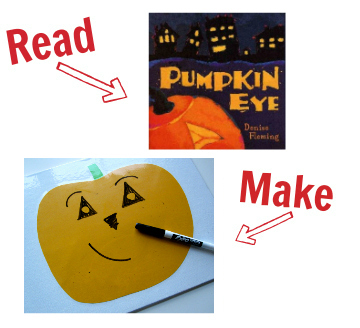 Pumpkin Eye by Denise Fleming and Dry Erase Jack-O-Lantern. 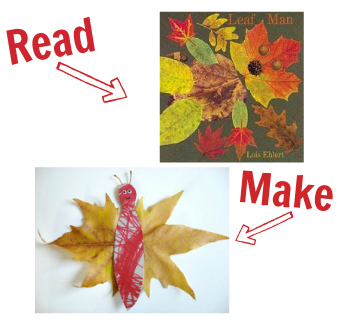 Leaf Man by Lois Ehlert and Leaf Butterfly Craft. 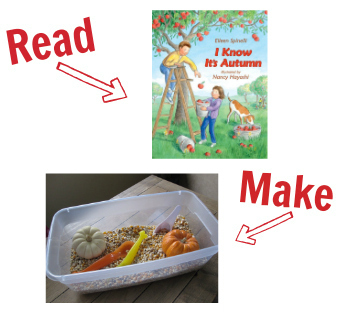 I Know It”™s Autumn by Eileen Spinelli and Simple Autumn Sensory Tub. 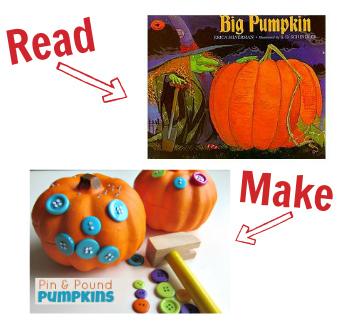 Big Pumpkin by Erica Silverman and Pin and Pound Pumpkins. 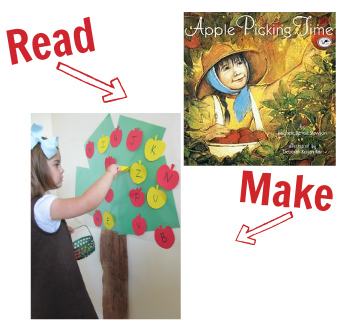 Apple Pic king Time by Michele Benoit Slawson and Peel and Pick Apple Tree. 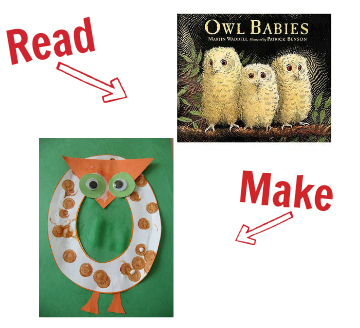 Owl Babies by Martin Waddell and Letter O Owl Craft. 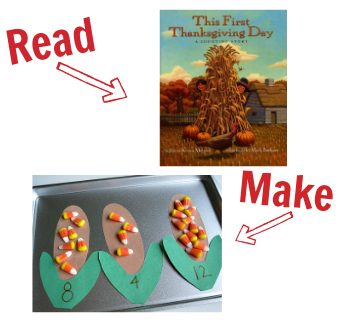 This First Thanksgiving Day: A Counting Story by Laura Krauss Melmed and Candy Corn Math. 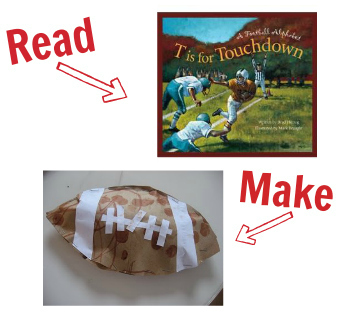 T is for Touchdown: A Football Alphabet by Brad Herzog and Simple Football Craft. 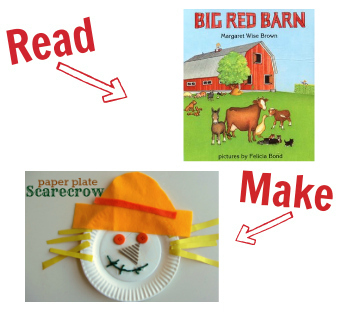 Big Red Barn by Margaret Wise Brown and Paper Plate Scarecrow. 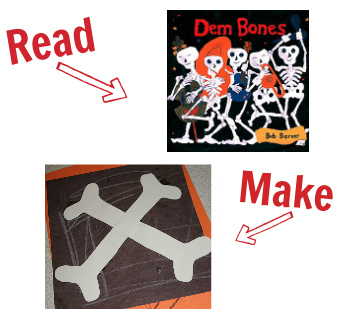 Dem Bones by Bob Barner and X-ray X letter Craft. 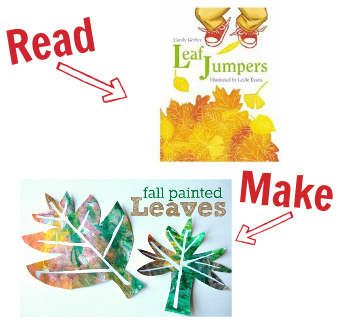 Leaf Jumpers by Carole Gerber and Tape Resist Leaves. 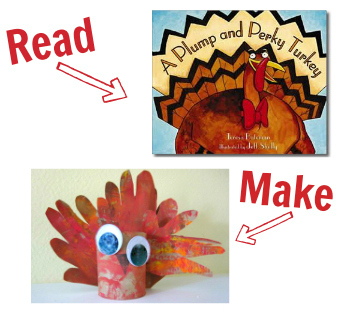 Want more Read & Make ? 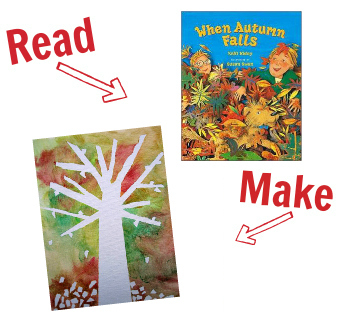 Check out the first post in this series with 25 popular children’s books and matching crafts. Click the image to jump to that post. As stated above this post contains affiliate links. That is my plan! Glad you like it. This is so great! 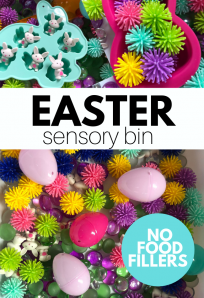 I can’t wait to try some of these with my little one. Thank you for posting! 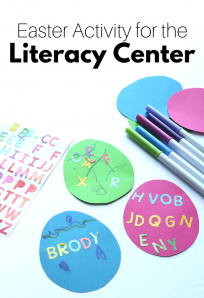 This is such a cool post with great ideas! We just read a book called Ramadan Moon as we are muslim and celebrated Ramadan. 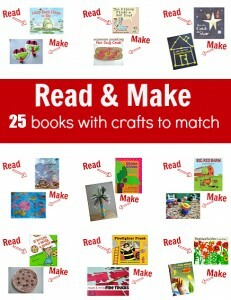 we also made many crafts I’m the book. I totally like your thinking! I have heard good things about that title – I am eager to check it out. 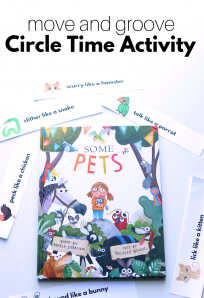 I have never writeen a review with any Muslim themed picture books and it’s about time I do! These are really great ideas. Thank you! I am sooo thankful for people like you… You do all the hard work to put these together, and you make my life just a little easier! This is amazing! I love that people use this – thanks for letting me know you do!